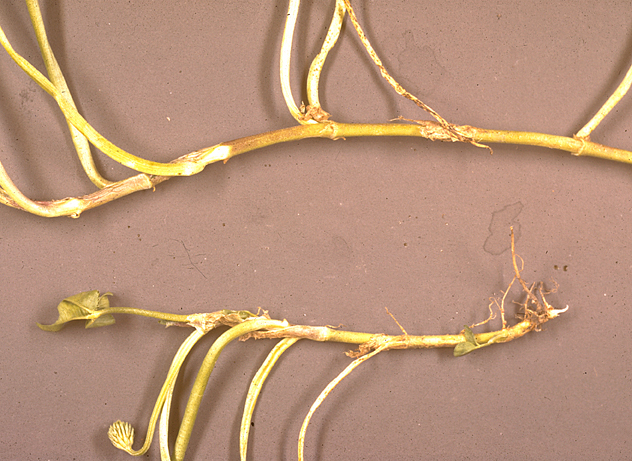 Herbaceous, perennial forage legume with prostrate growth habit and stolons that root at nodes. Used in humid regions and irrigated grass-legume pastures worldwide. Produces high-quality pasture, hay, and silage when planted with a grass; excellent feed for livestock and poultry. As a cover crop it grows rapidly and spreads quickly via stolons; frequently used in orchards and vineyards. Fixes nitrogen, improves soil, and provides pollen and nectar for pollinators. Distribution extends from the Arctic regions of Russia and Canada to the subtropical areas of Australia and South America. Inflorescence is a spherical head borne on long peduncles with 20-100 white to pinkish florets. Palmately trifoliolate leaves are borne on long, glabrous petioles. Leaflets are oblong to wedge-shaped, serrated around the margin, usually with a v-shaped water mark; cultivars have red markings. Stipules are membranous, oblong to lanceolate. Most roots are found within the top 8 inches (20 cm) of soil. 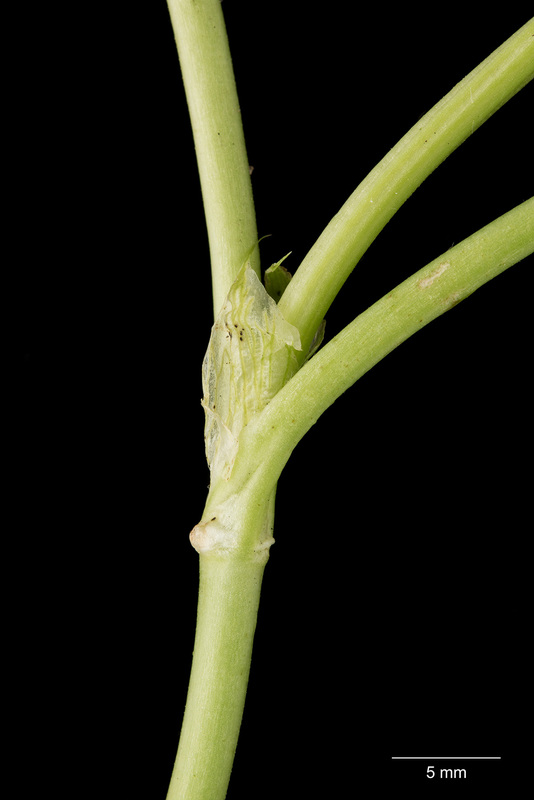 A short (6 in, 15 cm) taproot develops after germination and decays after the first year. 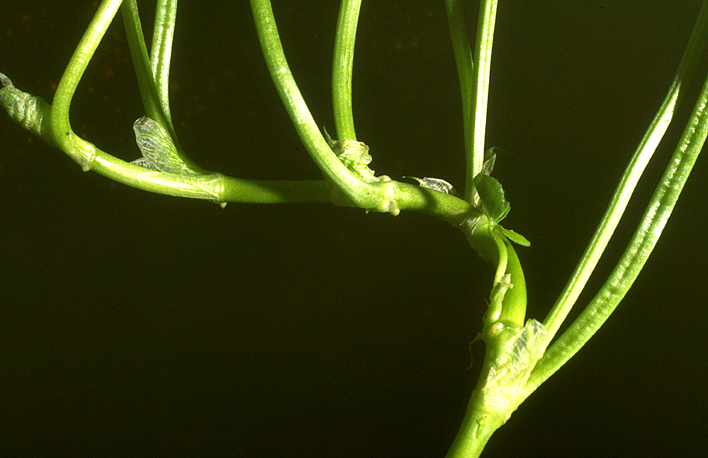 Adventitious roots develop at the nodes of stolons. 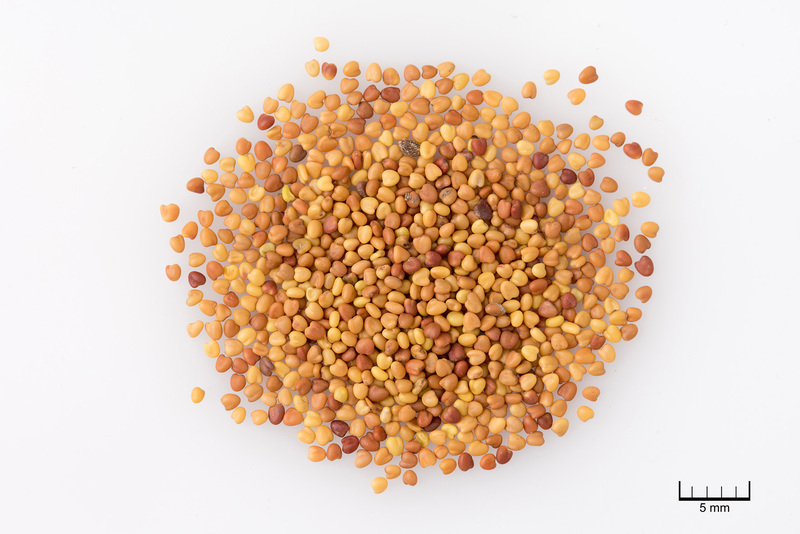 Seeds are small (1.1-1.2 mm long, 0.9-1.0 mm wide) with 800,000 seeds/lb (1,764,000 seeds/kg). They are heart-shaped [round to ovate (egg-shaped), triangular, or oval] and their surface is smooth, with a yellowish to reddish color. 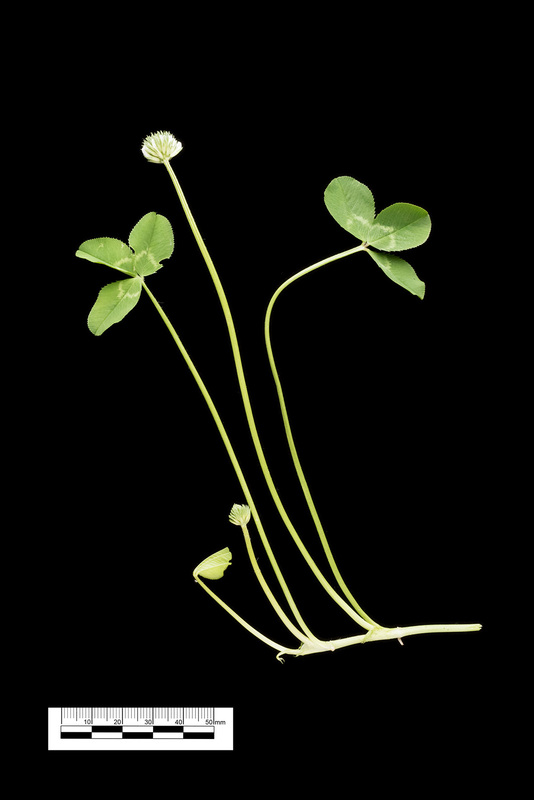 White clover types display varying degrees of prostrate growth, as it spreads by stolons. Small (wild) types have very short, prostrate growth. Medium ('New Zealand' and 'Dutch') types are larger. Large ('Ladino') types have very large leaves and longer petioles, making them more suitable for haying systems. 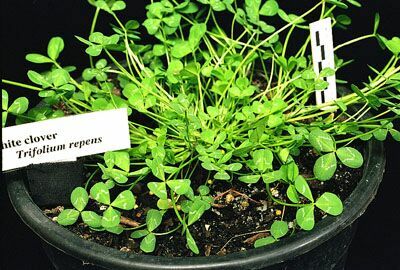 Persistence of white clover is medium; its short taproot decays after the first year, with its regenerative potential through its stolon growth, rooting at the nodes. 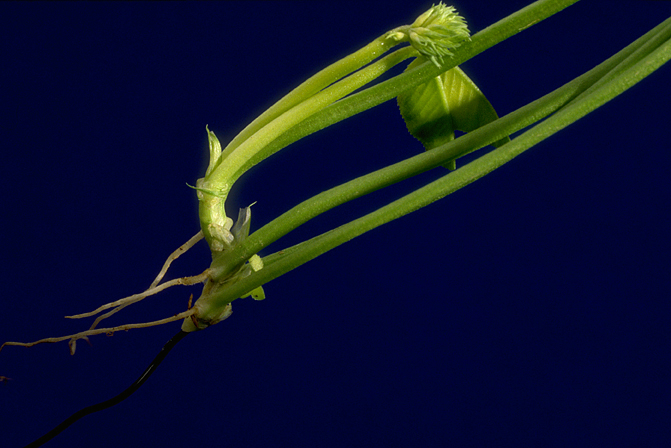 Stand longevity is promoted from this asexual propagation or reseeding. 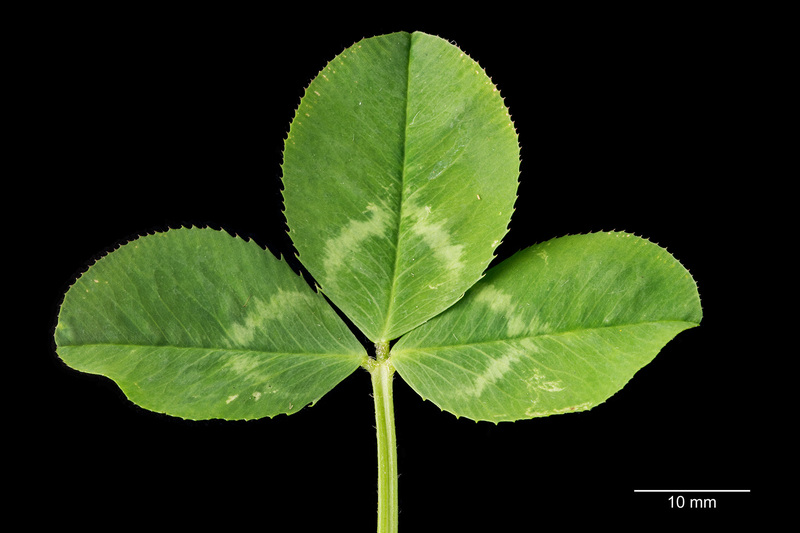 White clover is susceptible to many viral diseases which reduce its vigor and result in death from secondary causes. 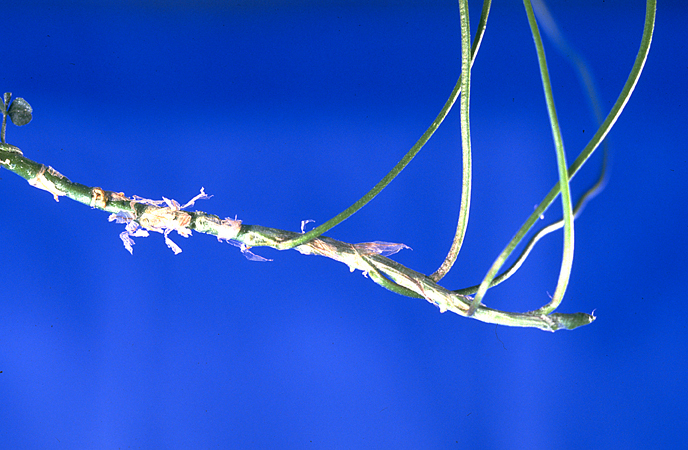 Partial or complete stand loss also can occur from root diseases and root-knot nematodes. 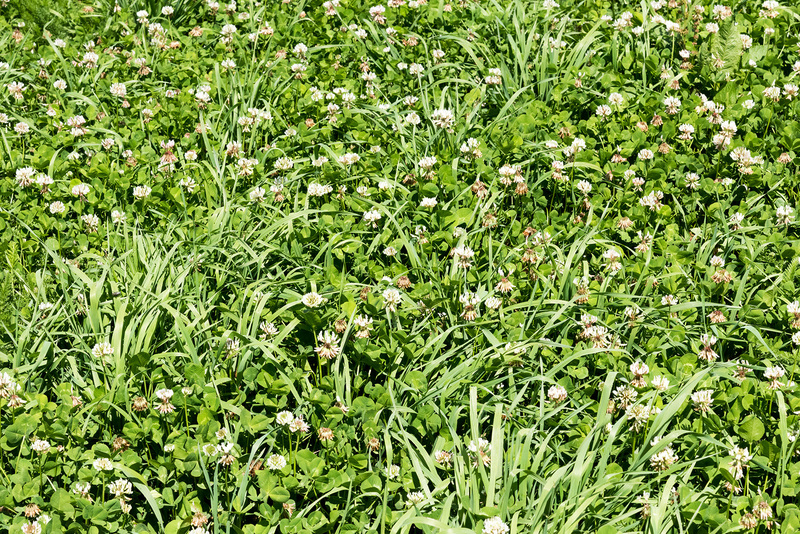 White clover populations cycle dramatically. It is highly susceptible to drought, most often the cause of substantial stand losses. 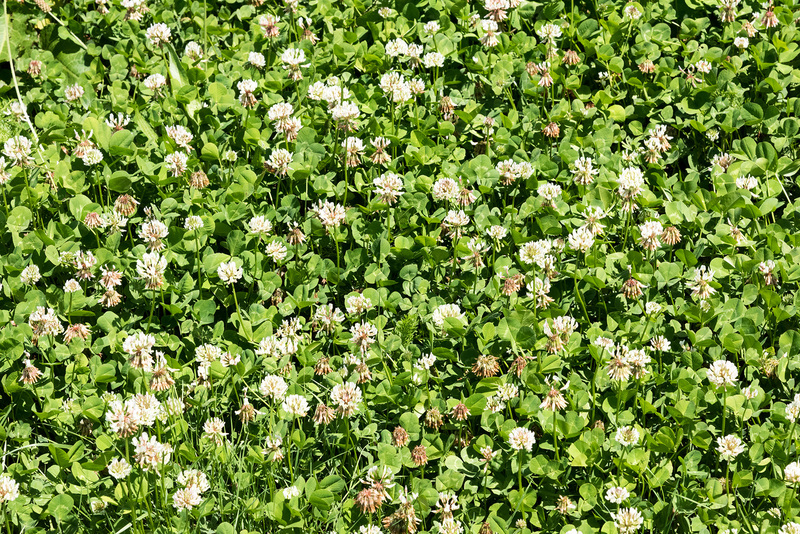 White clover is a cool-season legume. Growth begins at ~50 °F (10 °C) and slows greatly above 85 °F (~30 °C). Optimal growth occurs between 68 and 71 °F (20-22 °C). In non-irrigated conditions, the majority of production occurs in mid-spring and early summer, with a small increase in autumn with increased soil moisture. 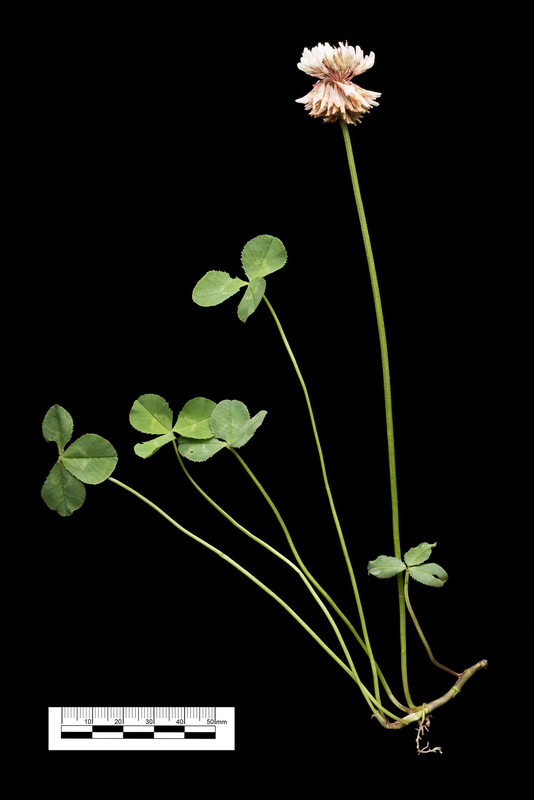 Three types of white clovers are recognized: small, intermediate, and large. Small types persist well due to their prostrate growth habit. 'Kent Wild White' is an example cultivar. Intermediate types flower more profusely than large types, allowing them to be used as reseeding winter annuals in southeastern US pastures. Example cultivars include 'Common', 'White Dutch', and 'New Zealand'. Large types have the largest petioles, leaflets, and stolons and produce the most forage, especially under rotational grazing or mechanical harvesting systems. The name Ladino was derived from the ecotype name "Ladino Gigante Lodigiano." 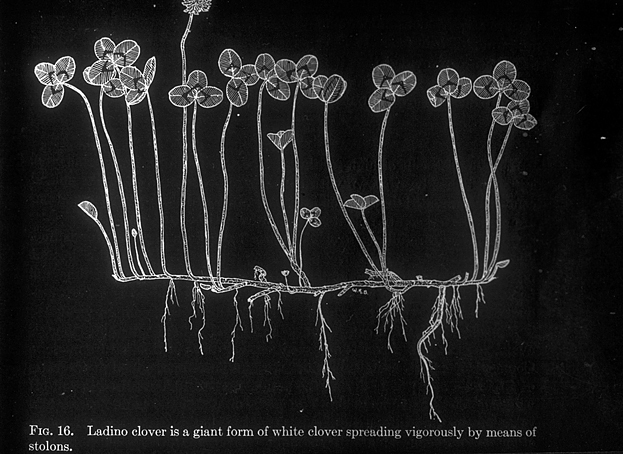 Although "Ladino" is now used to describe all large-type white clovers, it is incorrect since large-type white clovers are now quite different from the original Italian ecotype. 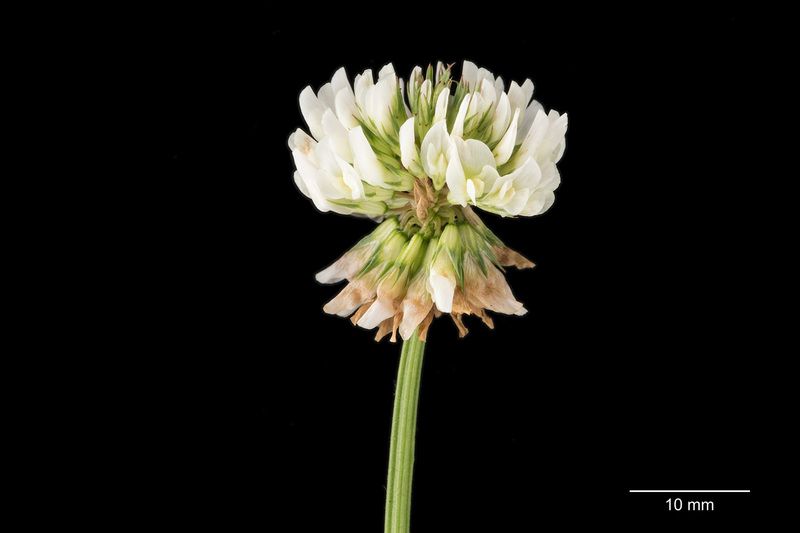 'Regal' and 'Osceola' are examples of large-type white clover cultivars. Cold-tolerant white clover is suited to humid, temperate climate regions and has low heat and drought tolerance; USDA Plant Hardiness Zones 6-9. Requires 25-40 inches (635-1000 mm) of precipitation or irrigation. Thrives on well to poorly drained soils, and requires irrigation if soil moisture is low. Tolerates acid to moderately alkaline soil conditions. Tolerates flooding duration of 7-30 days, depending on temperature. Tolerates soil pH 5.1-8.4, but best suited to 5.8-7.5. Moderately sensitive to salinity (1.5-3 dS/m). *USDA Plant Hardiness Zones 4a-9b. Heat zones ,= 31-32 °C; 88-92 °F. Precipitation requirement: Requires 25-40 inches (635-1000 mm) of precipitation or irrigation. Rooting: small, shallow; 70% in top 15 cm; depth to 8 inches, 20 cm. *** Soil pH: NRCS Range and Pasture Handbook, Chapter 3 classification for White Clover is Strongly Acid to Moderately Alkaline (5.1-8.4). Classifications:: (1) Very strongly acid to strongly alkaline, 4.5–9.0; (2) Very strongly acid, 4.5–7.3; (3) Strongly acid, 5.1–7.3; (4) Moderately acid, 5.6–7.3; (5) Moderately acid to moderately alkaline, 5.6–8.4; (6) Slightly acid to moderately alkaline, 6.1–8.4; (7) Near neutral, 6.1–7.3; (8) Alkaline, 6.7–9.0. † Soil drainage: NRCS Range and Pasture Handbook, Chapter 3, Table 3-4; Classification for White Clover is Tolerant of PD to WD Soils. Soil drainage class abbreviations: (1) VPD, very poorly drained; (2) PD, poorly drained; (3) SPD, somewhat poorly drained; (4) MWD, moderately well drained; (5) WD, well drained; (6) SED, somewhat excessively drained; (7) ED, excessively drained. Percent Relative Yield for White Clover for the classes 1-7: 25, 50, 75, 100, 100, 55, 30. 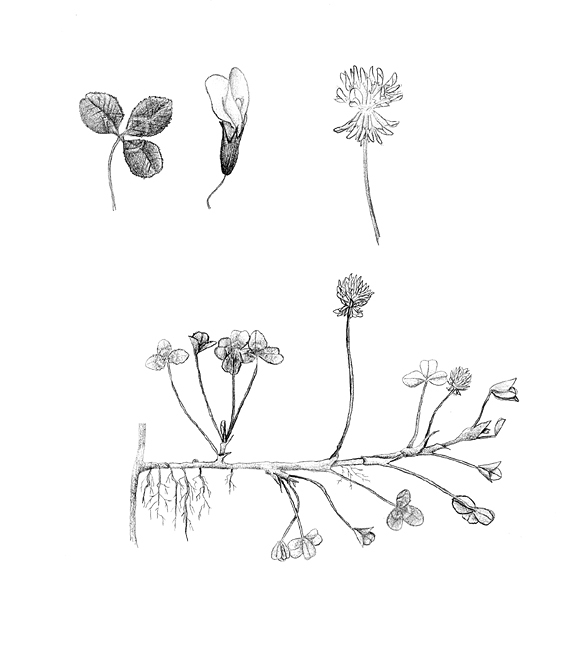 # Soil salinity: NRCS Range and Pasture Handbook, Chapter 3, Table 3- classification for White (and alsike, Berseem, red, strawberry) clover is Moderately Sensitive (1.5-3 DS/m). Classifications are: (1) Tolerant, 6–10 dS/m; (2) Moderately Tolerant, 3–6 dS/m; (3) Moderately Sensitive, 1.5–3 dS/m. Historically, maps have been drawn based on primary use areas, showing broad geographic areas, e.g. Compendium of Common Forages maps within Forages: An Introduction to Grassland Agriculture, 7th ed. (2018), John Wiley & Sons, Inc.
More highly detailed maps, based on quantitative climatic and soil factor tolerances and using GIS spatial grids, provide information on where species are suitable for a variety of intended uses. The following collection of maps were developed by a group of Oregon State University scientists, using the PRISM-generated collection of climate factor grids and the NRCS soil characteristics database. Click on the thumbnail image to view a larger map. High in protein and digestibility; produces excellent forage quality. High bloat potential when grown alone or >30% of pasture mixture. Susceptible to slug damage.